Jason Priestly (no, not that one) is left standing on the corner of Charlotte Street holding a disposable camera. The Girl has left it behind but it's too late to hand it back and he doesn't know who she is. His flatmate and best mate, Dev, thinks they should get the film developed and look for clues to her identity. Jason thinks they're bordering on stalking. Yet, there's a link, a tenuous one at best, and they team up with ex-pupil, Matt, to uncover the pattern in the photos. Jason's had a rough time of things lately. The prologue is rather dark and may leave you feeling, just for a moment, that this isn't the humorous book you were expecting. Whilst it does have its serious side, it's full of Danny's trademark, charming humour. Just like the funny parts are funny because they are grounded in reality, the characters are incredibly real and that includes their faults. Humour can often be a mask to hide behind. It's one of those books that captures the current day of normal people like you and me. They may get a bit drunk and say stupid things on Facebook when their ex is happy and engaged. They might create fantasies out of people they bump into on the street and may never see again. Yet there's that hope that they might. They might not be all that great at their jobs but muddle through anyway. There's a hint of recession but nothing overwhelming to the plot, just enough to place it in the now. What a terrible thing, I thought, to let a moment go. As a photographer who has moved from film to digital, I loved the little photography metaphors. Photographs have become so less special in the digital age, yet there are still thousands who love that finite quality of a roll of film. I also love how the story of The Girl unravels through the photographs. Danny's first foray into fiction has been a huge success. I did at times picture Jason as Danny himself, which is difficult when a writer has done so much autobiographical writing, yet as the story develops Jason becomes his own person. The characterisation is spot on and I just wanted to keep reading about their lives, but alas, all good things must come to an end. 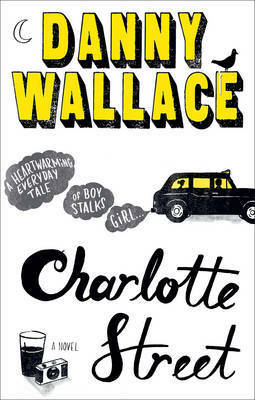 Charlotte Street will be available in trade paperback and ebook formats from 10th May 2012 and is published by Ebury Press. Thanks go to the publisher for providing me with a copy for review. I love Danny Wallace and this book sounds right up my street. With any luck my library will have it. It did take me a few minutes to realise who the other Jason Preistly was. Funny considering I had posters of him up in my room at one time. Oh, and my sister is an artist. She has an amazing digital camera but still goes back to the old SLR. I haven't read anything by this author before -fiction or non-fiction-, but this book sounds really interesting. I love male main characters, contemporary novels and photography.